Religious symbolism is the use of symbols, including archetypes, acts, artwork, events or natural phenomena by a religion. Religious texts, rituals, and works of art are seen as symbols of compelling ideas or ideals by religious groups. Your child will be learning about Religious Symbols at school in Key Stage 3. They will learn the meaning and significance of symbols in a religion and how symbols can help a religious person in their faith. They will specifically look at the beliefs and practice of Sikhs and the symbols that help Sikhs in their faith. Discuss some of the symbols that we see used today in society and why we use them. Find some pictures or a book with information on your own religion and discuss some of the associated symbols. If you have any access to religious artefacts show them to your child and discuss their importance. Choose an artefact or picture of an artefact and research it with your child. Look at books, CD ROMs, video or the Internet and write a short report on what the object stands for. Think about how the wearing of outward symbols of faith can help a person or possibly even be difficult. How might it be difficult for a teenager following a religion in Britain today? Make a list of the major religions in the UK today and find out about their symbols. Christian, Buddhist, Hindu, Jewish, Islamic and Sikh religions all have their own identifying symbols. Look at pictures of Sikh symbols and talk about the 5 Ks and what they stand for. There is plenty of information and pictures available on the Internet, in books, and on CD ROMs. An interesting topic to investigate at home with your child could be the wearing of turbans in society. There are plenty interesting articles available, such as on cases where Sikhs were dismissed from their jobs as policemen for wearing a turban. 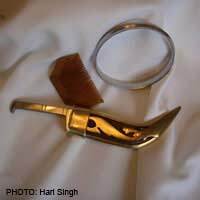 Another interesting case was where a Quebec court ruled that a 12-year old Sikh boy should be allowed to wear his ceremonial dagger. Discuss with your child the contents of the articles and whether a person's faith is a good reason for exceptions to the law being made. If you child has friends in the Sikh faith encourage them to ask questions about the religious issues that are important to them and the symbols that they use. Find out how the symbols help them in their faith but also ask about the difficulties they face because of wearing the symbols. Religious symbolism is an important component of many different religions and their study is a great way to learn more about a religion and its beliefs and traditions. If your family follows a particular religion looking at and learning about its symbols is a great way to introduce the topic of symbolism. Learning about religious symbolism at home will help your child to better understand a religion and remember what they have learnt in the classroom.